Day one was pretty cool. We were placed up front in the wheelchair division. I even had the opportunity of having my wife Stephanie be the spotter to run along-side of us; who herself is an avid runner. It was pretty neat to see the spectators clap and cheer for us. Greg and Stephanie running from my perspective in the race. Day two was the most memorable. What had happened that morning was nothing more than a Divine appointment. What normally happens at a race where Care2Tri is participating in, they are given about a three to five minute head start. That morning there was no wheelchair division and being that it was Care2Tri’s first time at Gasparilla, they did not know of our usual protocol. So we settled in about seventy five feet from the start line in with the crowd of runners. Had we not have been in the crowd that morning, I would have missed that experience I felt to convey to you the reader. While we were waiting for the race to start there were a couple people who asked Greg about Care2Tri. At one point I heard Greg express his concern of being in the crowd with 28,000 other runners as he felt could be a little dangerous. The gentleman he was expressing this to offered to help clear a path. 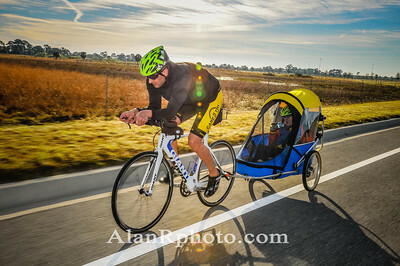 I thought to myself wow here is a perfect stranger who’s willing to help in a race that he himself will be running in. And we’re off! 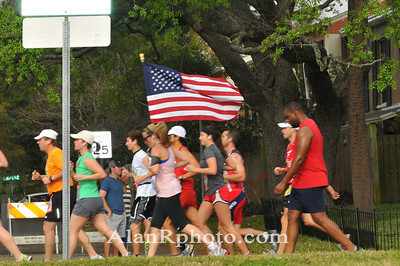 During the course of the run, there were countless of fellow runners that were encouraging me and cheering me on. What an awesome feeling! Being different, outside of the race world, I’m not always treated as positively. But during the race it is such an overwhelmingly positive environment. I could literally feel such a strong sense of inclusion and comradery among everyone. It was at the end of the race that I realized the impact of what Care2Tri does, is and means for people like me and who are physically challenged. Through Care2Tri we have the unique opportunity of being able to participate, be and feel included in the sport of racing along-side every else…including professional runners! Now how awesome is that?! Me with Greg in the race. 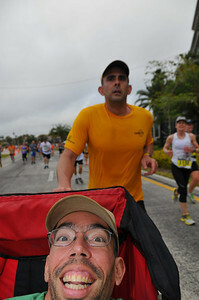 This entry was posted in Sports and tagged Care2Tri, equality, inclusion, opportunity, race, running. Bookmark the permalink.